Roman emperor AD 41-54, the son of Drusus and Antonia, nephew of the emperor Tiberius, and grandson of Livia Drusilla, the wife of Augustus, was born at Lugdunum (Lyons) on the 1st of August 10 BC. During his boyhood he was treated with contempt, owing to his weak and timid character and his natural infirmities; the fact that he was regarded as little better than an imbecile saved him from death at the hands of Caligula. 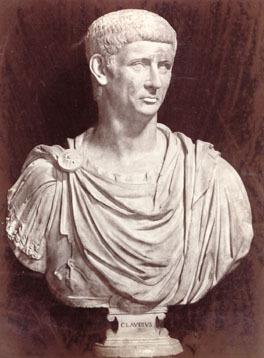 He chiefly devoted himself to literature, especially history, and until his accession he took no real part in public affairs, though Caligula honored him with the dignity of consul. He was four times married: to Plautia Urgulanilla, whom he divorced because he suspected her of designs against his life; to Aelia Petina, also divorced; to the infamous Valeria Messallina; and to his niece Agrippina. In AD 41, on the murder of Caligula, Claudius was seized by the praetorians, and declared emperor. The senate, which had entertained the idea of restoring the republic, was obliged to acquiesce. One of Claudius's first acts was to proclaim an amnesty for all except Cassius Chaerea, the assassin of his predecessor, and one or two others. After the discovery of a conspiracy against his life in 42, he fell completely under the influence of Messallina and his favorite freedmen Pallas and Narcissus, who must be held responsible for acts of cruelty which have brought undeserved odium upon the emperor. There is no doubt that Claudius was a liberal-minded man of kindly nature, anxious for the welfare of his people. Humane regulations were made in regard to freedmen, slaves, widows and orphans; the police system was admirably organized; commerce was put on a sound footing; the provinces were governed in a spirit of liberality; the rights of citizens and admission to the senate were extended to communities outside Italy. The speech of Claudius delivered (in the year 48) in the senate in support of the petition of the Aeduans that their senators should have the jus petendorum honorum (claim of admission to the senate and magistracies) at Rome has been partly preserved on the fragment of a bronze tablet found at Lyons in 1524; an imperial edict concerning the citizenship of the Anaunians (15th of March 46) was found in the southern Tirol in 1869. Claudius was especially fond of building. He completed the great aqueduct (Aqua Claudia) begun by Caligula, drained the Locus Fucinus, and built the harbor of Ostia. Nor were his military operations unsuccessful. Mauretania was made a Roman province; the conquest of Britain was begun; his distinguished general Domitius Corbulo gained considerable successes in Germany and the East. The intrigues of Narcissus caused Messallina to be put to death by order of Claudius, who took as his fourth wife his niece Agrippina, a woman as criminal as any of her predecessors. She prevailed upon him to set aside his own son Britannicus in favour of Nero, her son by a former marriage; and in 54, to make Nero's position secure, she put the emperor to death by poison. The apotheosis of Claudius was the subject of a lampoon by Seneca called apokolokyntosis, the "pumpkinification" of Claudius. Claudius was a prolific writer, chiefly on history, but his works are lost. He wrote (in Greek) a history of Carthage and a history of Etruria: (in Latin) a history of Rome from the death of Julius Caesar, an autobiography, and an essay in defense of Cicero against the attacks of Asinius Gallus. He also introduced three new letters into the Latin alphabet, none of which survived -- one for consonantal V, one for BS and PS, and one for the intermediate sound between I and U.